Art4Agriculture Chat – Page 84 – The world needs creative, innovative and courageous young people who can connect, collaborate and act. We know that youth may only be 20% of the population but they are 100% of the future. The time is now to let them share their dreams and design the future they want to see. With Richmond High School students at sport art teacher Simon Wyatt was on hand to share the Richmond High School Archibull Prize journey and the story of “Patti” with the judges. NLIS is the National Livestock Identification System developed to help Australia trace animals, improve market access, and manage disease and residue control issues. In cattle, electronic ear tags or rumen boluses (an electronic tag deposited in the stomach) are used to individually identify and trace their movements in NLIS. By using this method, individual animal movements can be recorded on a central database, enabling fast and accurate tracking of cattle movements for disease or residue-affected animals. The system also provides documentary records of movements, such as waybills and combined NVDs and waybills. Because NLIS is both electronic and permanent, individual animals can be traced faster and more accurately than with the previous tail tag and waybill systems. In the event of a disease outbreak, quarantine measures can be deployed faster and with limited costs to industry and government. The system also allows for faster return to business enabling the rapid removal of suspect infected or contaminated animals. The previous tail tag system tracked cattle from their consignment property to sale or slaughter. Beyond that, tracing relied on paper-based records held on farms or elsewhere. Where is the demand for NLIS coming from? Global trends are very clear; our major customers and competitors are rapidly moving towards individual animal identification tracking systems. In 1999, the European Union was the first to require individual animal identification to support hormonal growth promotant (HGP)-free certification. Canada, Japan, Uruguay, and Brazil all have government and industry-backed individual animal tracing systems in place. upholding Australia’s reputation as a producer of safe, wholesome beef and dairy products. improved deterrent to stock theft. 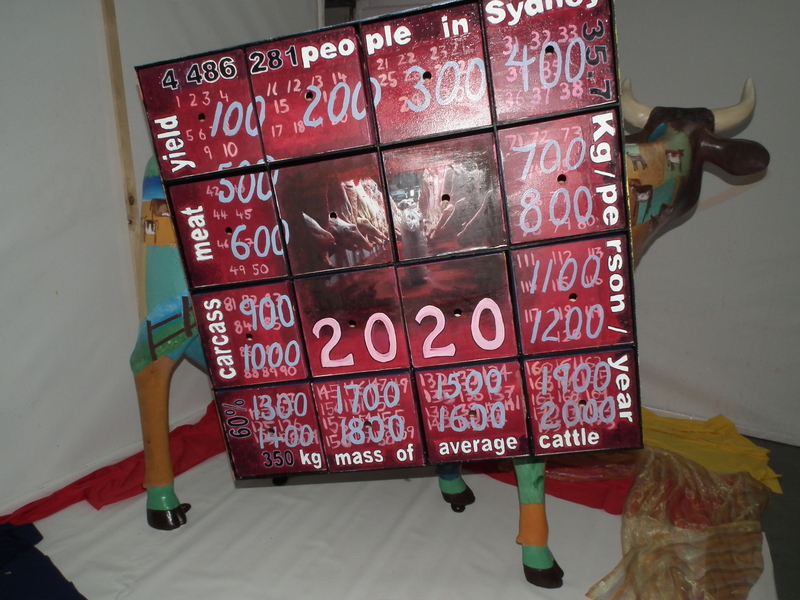 Richmond High School Archibull prize 2011 Entry "Patti"
Who would of thought you can turn a cow into a table? Cranebook High School, can that’s who!!!!!!!! Third cab off the rank on day 2 of the Archibull Prize 2011 was Cranebrook High School in Western Sydney where the agriculture team under the guidance of the hard working and much loved Dani Saxon signed up for a second year of the Archibull Prize. This year students from year 8 to 11 collaborated to tell the story of sheep with the assistance of two life size fibreglass calves. We learnt about sheep production, the processes of farm gate to plate and ensuring the sustainability of our future. In the creation of our Archibull’s we focused on sheep production, both meat and fleece. We incorporated this industry with sustainability and the farm gate to plate process themes to present to the judges our two bulls. One Bull shows the history, process and variation through the fleece industry. The colours of the bull resemble a large quilt, with the white stitching between each colour. The painted tools scattered across this quilt show the history of shearing (showing the old hand shears and the modern electronic shears). The other tools are those used for husbandry practices on the majority of sheep farms in Australia (including the drench gun, elastrator and shears). The French knitted fleece over the bull symbolises the bleaching, dying and processing stages of fleece. For natural fleece to be usable by commercial produces, much of it must be dyed to suit the consumer demand (in this case it is blue). The French knitting gives the viewer a clear image of the products created from sheep fleece. Cranebrook’s second bull shows more of the farm gate to plate processes, incorporating sheep within it. On one side of this bull there are lush paddocks of pasture and extensive breeding of sheep and other farm animals. The Woolworths truck (a sponsor of the Archibull Prize) shows the long packaging, processing and transporting stage of most agricultural products. Having the Woolworths truck driving straight onto the dining table, on the opposite side of the bull, gives the idea of the farm gate to plate process (explaining to the viewer where there food and fibre come from). The opposite side of the bull (the dining table) shows the products from these animals and crops, such as the hamburger, sauces, chicken, fruit and vegetables. This gives the viewer a direct connection with the bull’s, as most of these products are found on everyday dining tables. Starting our Archibull’s was probably the most difficult stage of the Archibull Prize, combing all the ideas from across the school into two bull’s. Several classes ranging from year 8 to year 11 contributed ideas and sketches, which were put together and rearranged by our teachers. Once we had created the final design we began painting our base colours on both bull’s. On the table bull the legs were painted in a brown colour, to resemble the wooden legs of a table, whilst one side of the body was painted blue with a green horizon and the other side a peachy pink of a dining room. On the fleece bull we painted large patchy areas of bright colours and small white markings around each section (stitch marks). To create our dining bull we cut out pieces of thin wood for the table (which was lots of fun, trying to make the wood fit around the shape of the bull). We then glued large blocks of wood on the sides of the body and attached the table. After time the table eventually fell off (ooops!) and we decided to drill the table onto the bull rather than glue. We then placed the pasture of grass on the blue side and a cliché dining room tablecloth (red and white checked) on the other. Once the pasture and tablecloth was in place, the real fun began. We used plastic foods, animals and other crafty items to create a farm and a dining room. On the dining side we placed two plates of food, in front of two dining table chairs. On these plates consisted of agricultural products such as beef, chips and sauces. This shows the processes from the other side of the bull and shows the viewer where their food comes from. The window on the wall shows the view of the paddock from inside the dining room, with the sheep in the distance. This connects both the production and consumption of sheep. On the opposite side the small pond, surrounded by ducks and geese shows the biodiversity of a farm, and symbolises the water and nutrients needed to run a farm. The hay feeders scattered in the paddock shows the effort put into farms to correctly manage animals and provide nutrients for livestock. The various species of farm animals show the many different kinds of agricultural products produced to feed Sydney for a day. Cranebrook’s second bull was created through the painting of tools and equipment used to produce sheep. The old hand shears show the history of shearing mechanism, compared to the electronic shears used now. These were painted on by using our own tools used on our school farm. A drench gun, elastrator, castrating knife, NLIS tags and ear tagger are also found on the bull, to show the husbandry practices used to produce sheep. Without these tools many livestock would die from pests and disease and many could not be identified. Once the basis of these shapes were painted we added definition and detail to create a more realistic image of them. We then attached the French knitting to the bull, which resembles the processing of natural wool (dying, bleaching and spinning). 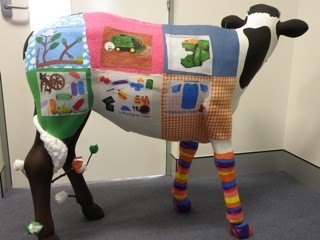 The Archibull Prize journey was amazing, we learnt so much about the production of many different agricultural products, learning where our food and fibre comes from and how they reach our homes. 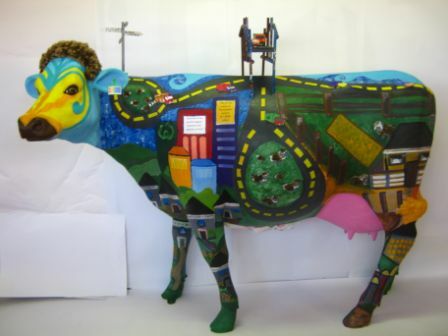 Author Picture You in AgriculturePosted on November 20, 2011 November 20, 2011 Categories Archibull Prize, CompetitionsLeave a comment on Who would of thought you can turn a cow into a table? The task is to put together a short video, no longer than 5 minutes to raise the profile of the school’s allocated food or fibre industry ( in this case beef) and promote the Australian farmers that produce it. How many ways can you tell the Story of Beef? After leaving Macarthur Anglican School exhilarated next cab off the rank for Archibull Prize 2011 judging was Caroline Chisholm College at Glenmore Park near Penrith. It was pleasure to connect up again with the college’s passionate and committed agriculture course co-ordinator Shelley Baldwin. 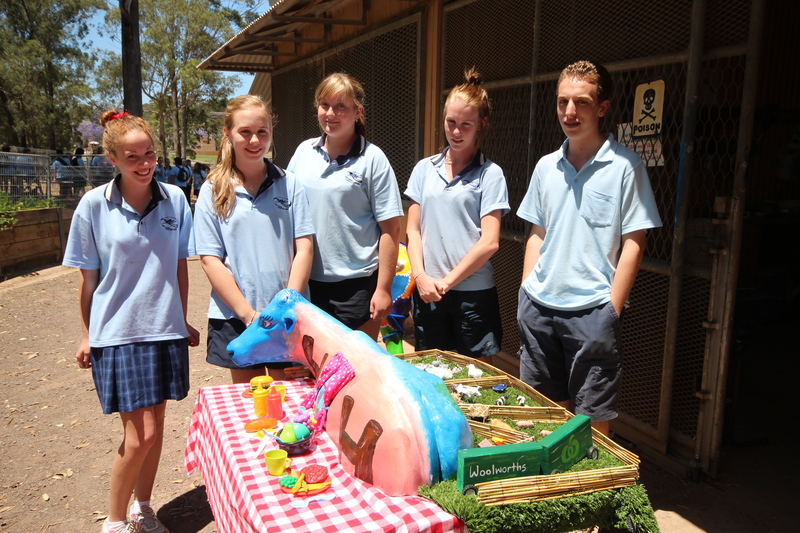 Caroline Chisholm College has been supporting Art4Agriculture programs since their inception with students taking out major prizes in Cream of the Crop Competition in both 2009 and 2010. 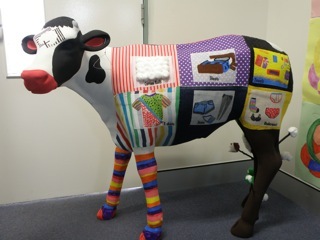 Wow Wow Wow the Archibull Prize 2011 judges found themselves totally overwhelmed by what the girls have achieved. 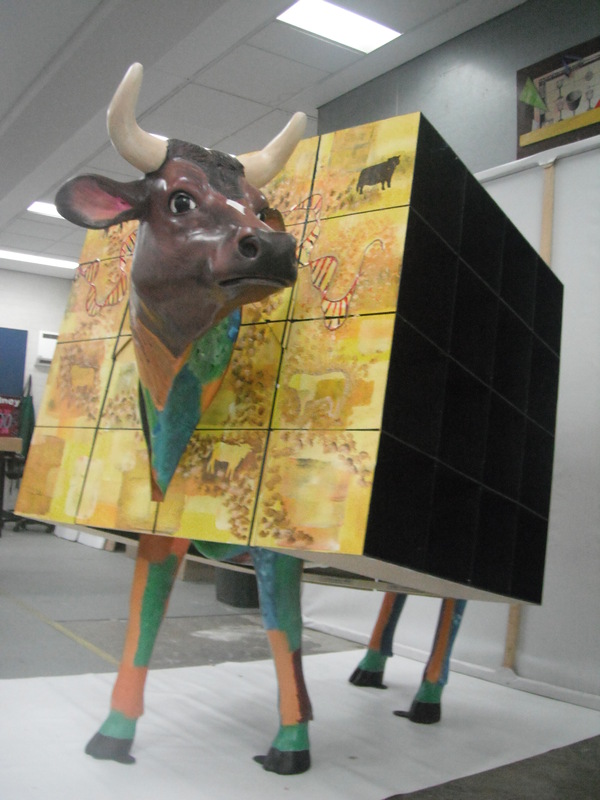 The students turned their fibreglass cow into a “Moo-biks Cube”, an interactive artwork which allows the viewer to flip the cubes (painted in a Cubism style) to reveal eleven different sides of agriculture. 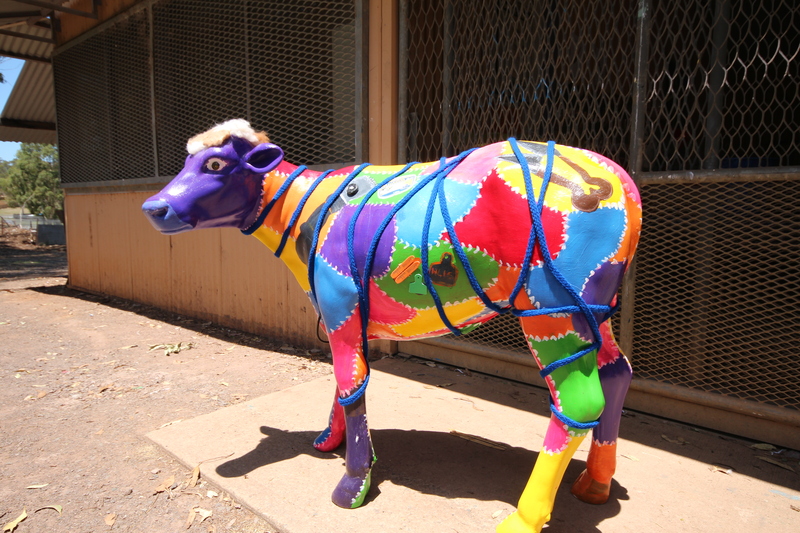 Shelley said Alison provided inspiration to the year nine to eleven students who collaborated on their Archibull Prize Entry. Alison’s speciality is data technology implementation for leading beef producers and the students have highlighted the use of technology to ensure tracebility of the beef product from paddock to plate on their Archie. Alison also has close ties to her family beef cattle operation MYANGA. She is also a Royal Agricultural Society of NSW Councillor and the 2011 NAB Agribusiness Cattle Council Rising Champion. “I wanted to relate to the girls on a very personal level, to show them there are many diverse career opportunities in agriculture and they don’t all involve getting dirty,” she said. 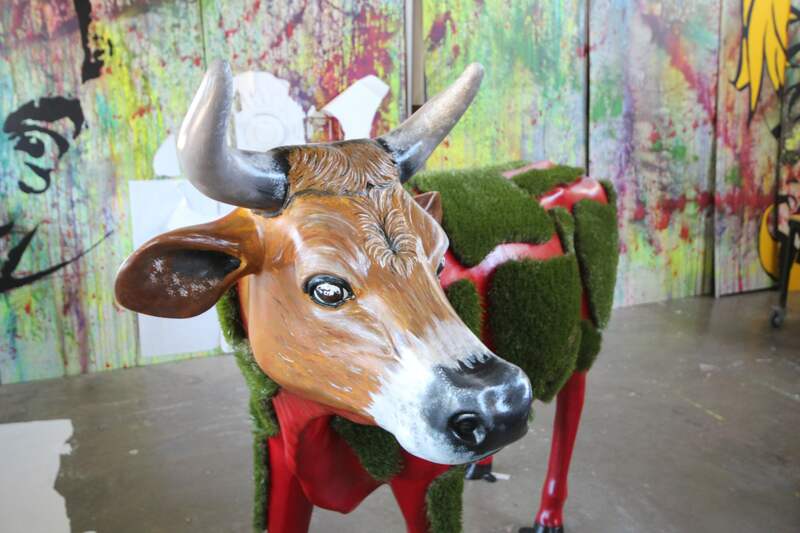 Shelley Baldwin, said the Archibull Prize opened up the girls’ minds to what they can do. “It shows them there’s a whole bunch of opportunities. They can work in economics, marketing, research or environmental management as well as in the more traditional roles,” she said. Author Picture You in AgriculturePosted on November 20, 2011 Categories UncategorizedLeave a comment on How many ways can you tell the Story of Beef? Its 5am and we are chomping at the bit on the first day of judging of the art component of 2011 Archibull Prize. Artwork judge Wendy Taylor and chief sidekick and fill in photographer/videographer (what an all-rounder) Lynne Strong were set the task by Loran and Kirsty of Event Directors of visiting all 21 school in 72 hours. Not an easy task and to make it worse no “tucker” breaks were factored in. That’s no latte’s (Lynne’s vice), no iced chocolates (Wendy’s vice) and no lunch let alone afternoon tea. 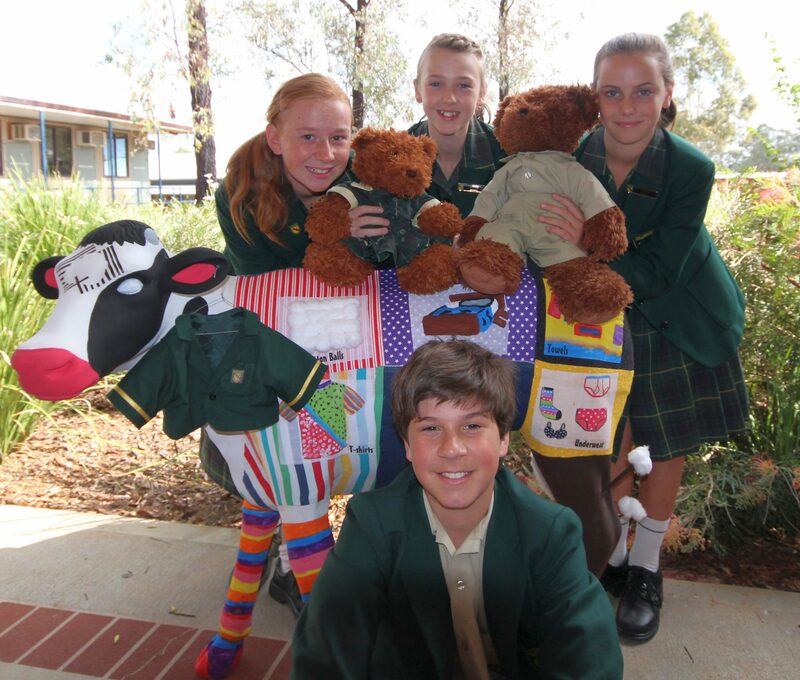 The school caters for K-12 but in this case it was the primary school taking on the Archibull Prize challenge. Macarthur Anglican School food or fibre industry was Cotton and their Young Farming Champion was Hollie. They named their calf “Gossy” (from the scientific name for cotton) and they took the programme and ran with it in many ways, particularly looking into the beneficial properties of cotton and why you would choose to wear cotton in preference to synthetic fibres. Back to Macarthur Anglican and Gossy Wendy and Lynne were excited to hear that the whole of the primary school appears to have been involved in some way or other in the Archibull Prize program, which was phenomenal. So Wendy had a chat with Katrina Ha and Lynne recorded the conversation and like us we are confident you will be amazed and proud of Next Gen and the people we charge with inspiring them. Then Wendy and Lynne managed to squeeze in a short, but needed (because we had been working so hard!) 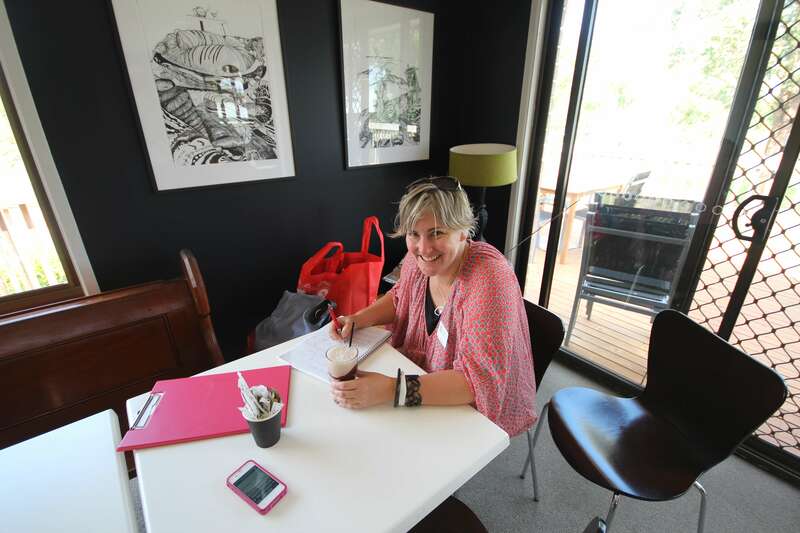 coffee break in the Macarthur Anglican School new school café which is in a converted house on the school grounds which also doubles as the school uniform shop. 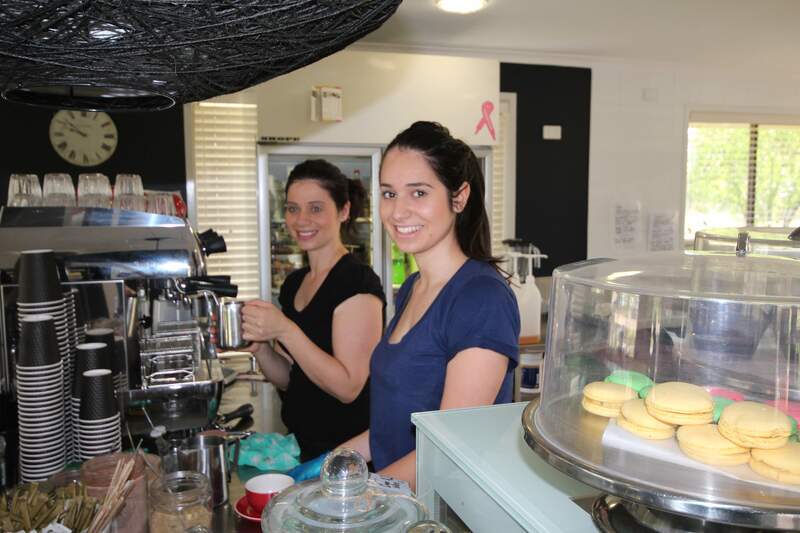 The café is open to staff, parents and senior students. (Anna and Rebecca make divine brownies too –just quietly!). Then it was on the road again. Off to Caroline Chisholm College in Glenmore Park this time. But more about that tomorrow night. Too tired! Not enough coffee! all the comments from the kids. You obviously put on a very fun ‘cotton day’. cotton and the many elements within the industry. I am so excited!! 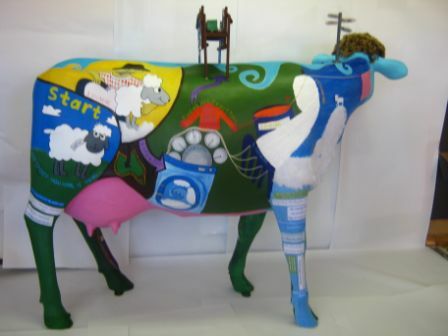 I love their Archibull – particularly the wool processing side of the cow. I think they have done a fantastic job and have really understood the elements of wool production and processing for a city market! I can’t wait for the final presentation and awards in December. I also liked reading their blog on my visit and I’m really pleased that they gained a lot from their time with me, especially increasing their awareness of career opportunities in the agriculture and sheep industry.